Raw Milk Aged Goat Cheese, Fresh Chevres, Brined and Marinated Feta, Flavored Farmers Cheese, Queso Fresco, Goat's Milk Soap, Pastured Eggs, Free Range Chicken, Grass Fed Beef and Pasture Raised Lamb. 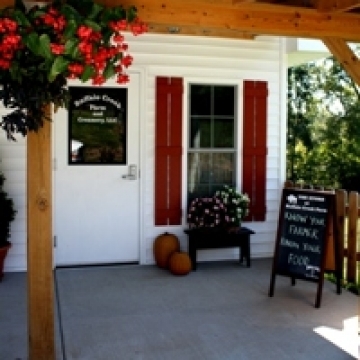 Local Foods: Amish Butter, Jams, Jellies, Honey, Herbs, Peanut Butter and Syrups. Goat Items: Necklaces, Toys, Books, Windchimes, Ornaments, Soap, Lotion, Laundry Detergent, Shampoo Bars, etc.